January 3, 2011 by kim 0 comments on "Post Chistmas News – Christmas Eating News"
Here is a summary of Christmas eating 2010. Happy New year – blimey its been over a month since I last updated this blog. Christmas and New Year are out of the way. I start back to work tomorrow after the Christmas break. Had plenty to eat over Christmas. The diet really went out of the window I’m afraid. 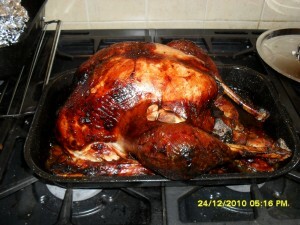 Here is a picture of the turkey we had for Christmas Day dinner. I was pretty tasty. I followed Nigella Lawson’s recipe and brined the turkey first, in a spicy brine mixture. During Christmas day we had the following to eat. Starter – Platter of cold meats, with bread rolls and butter. Bacon and sausages. Some sausages were wrapped in bacon. Choice of shop bought trifle or individual Christmas puddings with brandy sauce. A selection of various cheeses with grapes and crackers. All this was washed down with plenty of red wine. All in all a very satisfying meal if not particularly healthy eating. Also, so many leftovers I didn’t have to cook for a few days afterwards. Especially as I had also cooked a large chunk ham in the slow cooker on Christmas eve. On the weight front, I weighed 12 stone 3 pounds this morning not too bad as I just ate whatever I liked over the holidays. Still undecided whether to return to Lighterlife to lose the weight gained from the cruise. The reason for dithering is really the weather as any repeat of the snow we had in December would be really difficult to cope with whilst following the LighterLife diet. The reason is two-fold you need to pick up food packs weekly difficult if snow makes driving difficult and then coping with sub-zero temperatures when you are already feeling cold because of the diet. Christmas eating this year has been great but now back to basics. Next Next post: What Foods have Protein?